UConn will be alright. Really. Sure, the Huskies lost three key players in Gabby Williams, Azura Stevens and Kia Nurse to the WNBA, all drafted in the first round. But they return two All-Americans: seniors Katie Lou Samuelson and Napheesa Collier, as well as another veteran who will probably join them in that designation this year in junior point guard Crystal Dangerfield. This season’s other two starters happen to be the national high school players of the year two seasons running: sophomore Megan Walker and freshman Christyn Williams. Both are playing at a high level in UConn’s early season games. What’s not to like about that lineup? Does any team, other than perhaps Notre Dame, have a more sound starting five this season? The seniors have lost exactly two games in their careers: consecutive overtime losses in the National semifinal. Those losses carry a sense of failure for the Huskies unlike anywhere else. For any other team, reaching the Final Four is an outstanding season. But at a school where the team has lost three games by a total of four points in the last five years, where the team has reached 10 consecutive Final Fours, where 11 National Championship banners greet the players every day, the seniors are expected to have something to prove. 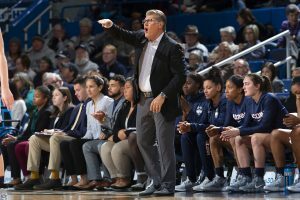 A look at the early season UConn team tells us that there is every reason to think that, with a little luck and barring injuries to starters, they could return once more to the round of four in March. The Huskies graduated their two best defenders, and this year’s team is “the worst defensive team I can remember,” according to coach Geno Auriemma. More on that later. This year’s starters, however, probably bring a more complete offensive game than either of the last two teams. All five can reliably shoot the three, all five can score inside, and all can bring the ball up the floor like point guards. Overall offensive quickness is outstanding and, of course, this year’s “big three” have improved from last year’s high levels of play. Katie Lou Samuelson drives to score. Photo courtesy of UConn Athletics. Samuelson is one of the most complete offensive players in the nation, and is certainly in the discussion for player of the year. At 6-3 she was the best outside shooter in the country last season (96-202, .475). In her sophomore season she shot 10-10 from beyond the arc in a single game against USF. She has improved year over year, become a balanced player who is willing to drive to the basket, and she will post up smaller players. She is not by any means a center, but her versatility means that very few defenders can match up with her both inside and outside the paint. Last year she shot over 50 percent from the field (.530) and better than 80 percent on free throws (.835). This season Samuelson is the obvious team leader, a role she has grown into, and in doing so has overcome a generally quiet nature. She is focusing on rebounding (a major need, following the loss of 15 rebounds per game to graduation). In six games, Samuelson is up to 6.2 rebounds per game, up from last year’s 4.5. She is a good defender, using her length to guard the perimeter and her quickness to recover to deter drives to the hoop. Unofficially, she is the charge-taking leader of the team. Megan Walker withstands tough defense. Photo courtesy of UConn Athletics. Collier is a 6-2 double-double machine, when she wants to rebound. This year that seems to be always. She is averaging 9.8 boards over six games, and has had a double-double in four of them. She is not a center, however, and that position has been given to the more solidly-built Walker, who is only 6-1. The scoring half of the double-double has never been a problem for Collier. A career .614 shooter, she has averaged 18.2 points per game over the last two years. She finds spaces in defenses that do not seem to exist, can finish with either hand or off glass, or however the defense allows. Collier’s .678 career field goal percentage is second only to Tamika Williams in program history. “When she touches the ball in the lane, it’s a surprise when it doesn’t go in,” Auriemma said. On this rebounding-challenged team, Collier only shoots occasional threes, as she is needed inside. But in her First Team All-American sophomore year, she hit 43 percent from beyond the arc. That threat (from five positions) spreads the floor to give her opportunities to drive to the hoop. 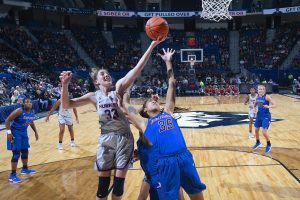 Collier is not a great defender, but she is long and athletic, and is the only semblance of a rim defender the Huskies have. 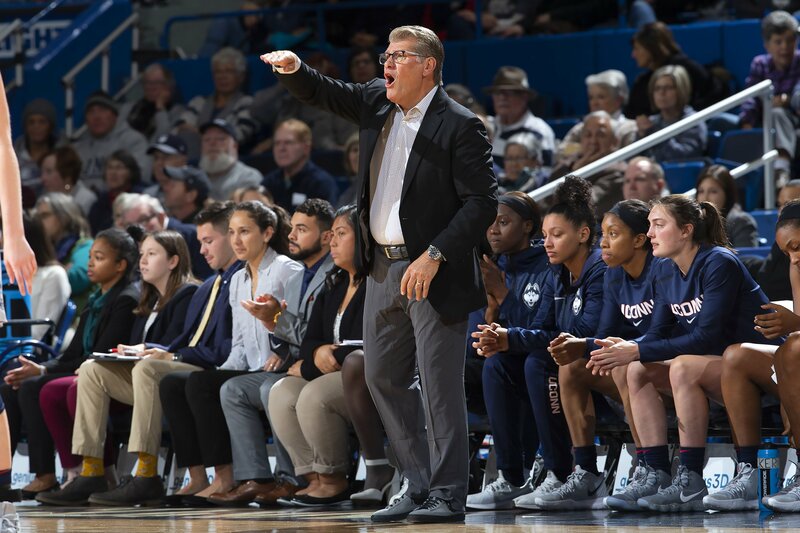 Auriemma’s switch to mostly zone defense allows her to use her quickness more effectively than if she were trying to defend a stronger, often-taller center one-on-one. That said, she did have 60 steals last season, which was second on the team to Williams. Crystal Dangerfield takes the ball inside the paint. Photo courtesy of UConn Athletics. Dangerfield has improved steadily since an up-and-down freshman year, to become a candidate for the Lieberman Award for best point guard. She returned from the summer noticeably stronger, without any loss in quickness. Given the scoring power around her, Dangerfield has always been a pass-first point guard. She knows when her team needs her, however, and is a skilled scorer, using both quickness and an excellent outside shot that appears to have no outside limit. 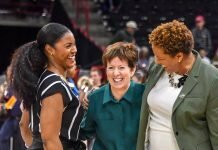 One of my favorite 2017-2018 Husky moments was Auriemma saying to her, “Crystal, go out and win this game!” She proceeded to lay 19 points on Baylor in the second game of her career. Dangerfield hit 62 threes last season at a .449 pace. Her shooting is even better this year, according to her coach. 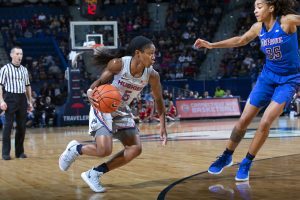 Dangerfield will have greater responsibility for setting up her teammates this season, in more traditional point guard mode. Last year, the offense ran through a forward, the departed Williams, who led the team with 5.5 apg. Dangerfield averaged 4.05. In six games this season, Dangerfield has averaged 5.3 apg. Her lifetime assist/turnover ratio is a very good 2.44:1. In UConn’s multi-talented offense, Dangerfield is relieved of having to bring the ball up on every possession, but she is still the primary ballhandler. She is capable of breaking the press on her own in most cases, and her quickness is matched only by freshman Williams on the team. She has grown into the team-general role, directing the half-court offense even when not providing the ultimate assist for a score. She is also the most likely player to take a time-pressured shot. Dangerfield is the team’s best on-ball defender, and does a good job of harassing opposing guards. Walker was the 2018 Naismith High School player of the year. She did not adapt quickly to the college game, and was viewed as a disappointment last season. Most of the time she seemed lost on the court, and rarely showed the confidence needed to play at the Division I level. She averaged just 5.8 points and 3.1 rebouds per game, mostly in conference play in the relatively weak AAC. Auriemma has noticed the difference. Despite her freshman struggles, it was obvious last year that she could rebound. Although not tall, she has the physical strength of a power forward, coupled with quickness, above-average hops, and that intangible “instinct for the ball” that all good rebounders have. The real change this year is Walker’s scoring mentality, which has translated into a solid contribution to the team. She shoots the ball with confidence, no longer instantly deferring to her teammates who may not have as good a shot. She is averaging 11.5 points, at a .547 average. Although she has shot .412 from beyond the arc, 22 of 29 buckets have been on drives and pull-up jumpers. Defense is a work in progress for Walker, as it is for many on this squad. She has shown marked improvement this year, however, as she has in her entire approach to the game. 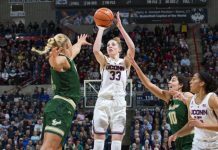 She will rarely shut a player down one-on-one, but her quickness and improving anticipation allows her to be an important part of the UConn zone defense. Christyn Williams powers a layup to score. Photo courtesy of UConn Athletics. 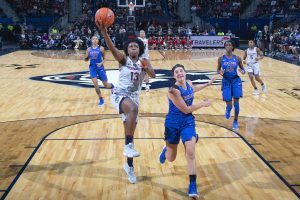 Williams, a rare freshman starter for the Huskies, is already compiling a highlight reel of quickness, scoring and athleticism. Her confidence level is sky-high, and she famously predicted a national championship before the season began. In 22 years covering UConn, the only players as ready to play at a high level from their first game were Diana Taurasi, Maya Moore, Brianna Stewart, and Svetlana Abrosimova – an obviously elite group. Williams has first-step quickness (and for that matter, many step quickness) that should be unguardable one-on-one by even the best defenders in the nation. She is fearless, and excels at every facet of the offensive game. Her averages over six games are remarkable: 10.8 points per game, .610 from the field, .500 from three, and 4 rebounds per outing. She leads the team in steals with eight. She arrived at UConn with all the strength needed to play at this level – something I’ve seen only in Moore before. 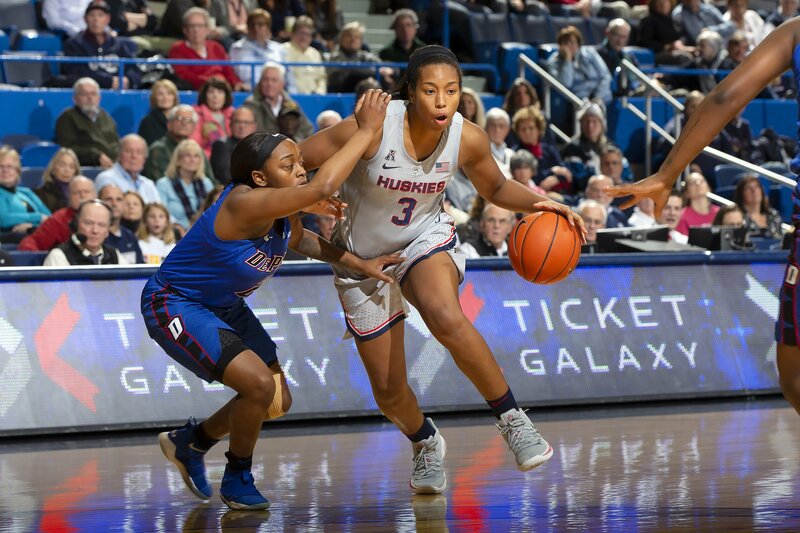 Against DePaul this week, she grabbed a rebound, and zipped down the floor with a defender in contact with her hip from half court, made the bucket and drew the foul. On a later play, she grabbed a rebound with an athletic leap over and backwards around a defender, grabbing the ball behind her head and avoiding a foul. A remarkable play. There have been very few freshman mistakes on offense, but a few more on defense. She is getting better, but recognizes that she needs to improve. Geno Auriemma. Photo courtesy of UConn Athletics. Defense has for years been a hallmark of Auriemma teams. If that is to be true come March, there is a ton of work to do. Auriemma’s concession to this defensive weakness is that the 2018-19 Huskies play mostly zone defense, something almost never seen from the team in the recent past. A zone can make up for average one-on-one skills, and is in fact, perfect for the skill set of the starters on this team. They are long, and everyone can guard the perimeter, including the tallest of them, Samuelson. Team quickness allows for quick coverage of ball reversal, and a cooperative protection from drives on the baseline. 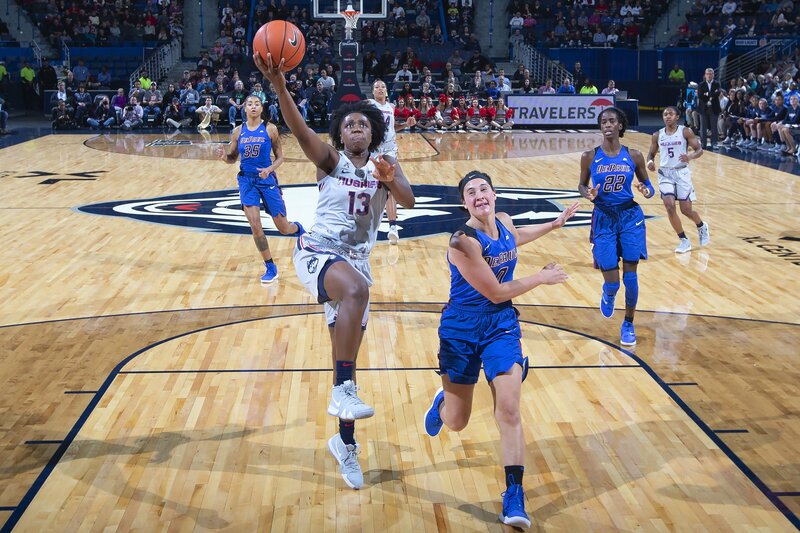 What UConn does not have is a center who can cope with the many talented bigs among the elite teams (‘because that girl decided to go early” said Auriemma, referring to 6-5 Stevens, who left for the WNBA with a year of eligibility remaining). How the Huskies will defend Baylor’s Kalani Brown, Notre Dame’s Jessica Shepard or Mississippi State’s Teaira McCowan is the great unknown. Unfortunately for UConn, they probably won’t do it very well. The only defense they will have, besides denying the ball to opponents, is to match their two-pointers with threes at the other end. That is a possible, but pressure-packed, solution, possible given the outside shooting of this Husky team. UConn does have 6-4 freshman Olivia Nelson-Ododa, but like most freshman centers, she will take time to develop. She has demonstrated her athleticism and shown some skills around the basket, but she is quick and tall rather than big and tall. She has also been foul-prone so far, fouling out in just ten minutes against DePaul, a team without a big center. The Husky bench is shallow and suspect, and there is no sixth-player who can easily step in for a starter without a dramatic decrease in output. Sophomore Mikayla Coombs has practiced well, and has outstanding quickness. She could develop into a good defender, but she still looks uncomfortable during play, as though wondering what her role should be. She had excellent credentials coming out of high school, and Auriemma has to hope she can gain the confidence and play that made her 2017 Georgia Player of the Year. She is not there yet. The rest of the bench are the same players that could not gain playing time last season, and none have shown marked improvement during the summer. Junior Kyla Irwin clearly understands the UConn system, and she can provide some minutes defending in the paint. But she has no offense, and lacks the quickness often needed to guard the forwards of today’s game. So, the Huskies will be alright. They will likely win most of their games, and will likely go deep into the playoffs. They are likely to lose a few games this year, though they are still more talented than nearly everybody else. The Final Four is possible, without doubt. Unless a starter gets injured. Auriemma has a history of getting his best players to improve, and getting his teams to the final rounds of the NCAA Tournament. He has five players that make these goals likely. None of them are going to grow into a down-low defender, however. And every successful team needs someone to come off the bench to back up the starters. Right now, that player has not emerged. That may ultimately be UConn’s greatest challenge this year.